Amazing, luxurious 500sq.m house built in 680sq.m. 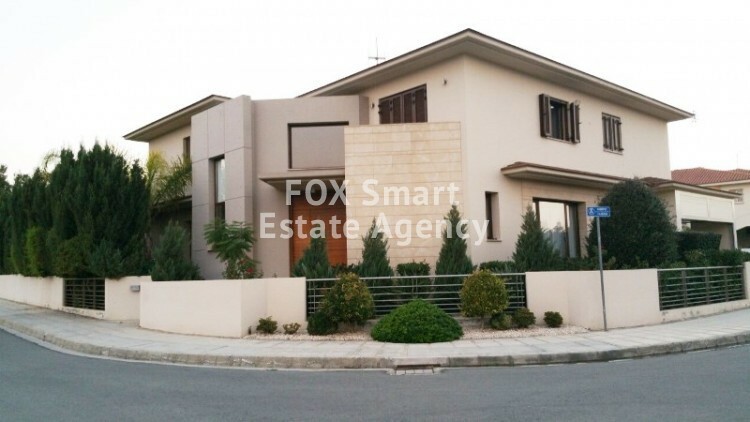 plot, located in a quiet residential area with easy access to Nicosia-Limassol highway. The house is surrounded by a beautiful garden with colorful flowers (irrigation system). Once you enter the house, on your left hand side there is a spacious sitting area, connected to the family room and on your right hand side, a separate dining room. A separated American-style kitchen with an extra room as a laundry, opens up to the BBQ area and the garden. The garage has access both to the basement and the kitchen. On the basement, there is a maid’s room with shower, a storage room and a boiler’s room. On the first floor, there are 4 en-suite bedrooms and another family room, which can easily be used as an office. Master bedroom with walk-in wardrobes. All bedrooms have beautiful view to the garden. VRV system, under floor petrol heating, sound system and vacuum cleaner system are some of the extra features of this house.